The XR Sport Seat is Cerullo's most popular touring seat. The deep side and lateral bolsters provide snug, exceptionally comfortable support for all driving conditions. 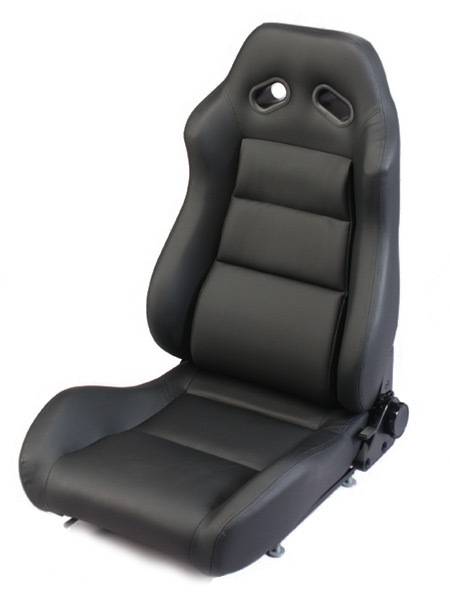 Specially formed shoulder support for excellent lateral hold, upholstered integrated headrest, harness belt capability, seat tracks and a fully adjustable seat back are included. The tilt/recline system allows the backrest to be returned to the upright position or tilted forward for rear access. Available in fabric, vinyl, leather, customer supplied materials, or two-tone colors of your choice. Note: This seat available with or without shoulder harness openings in the headrest section.